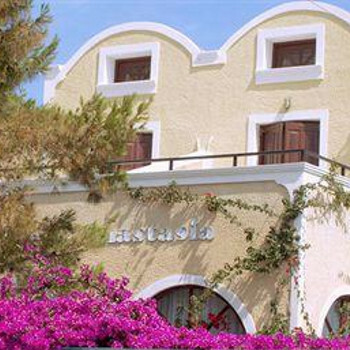 In a quiet location within the resort of Kamari, the 2 star Anastasia Hotel offers beautiful views of ancient Thira which sits on Messa Vouno mountain. The hotel features pool and traditional furnishings throughout. The hotel owners are very helpful and friendly, rooms are very comfortable and clean, although breakfast it very basic tea coffee bread and honey or jam. The Anastasia is a little off the beaten track, about a 15 minute walk into Kamari. Don't let this put you off staying at the anastasia it is a really peaceful and relaxing hotel.